Pro-Ject launches George Harrison turntable to celebrate the late musician's 74th birthday | What Hi-Fi? The deck is based on an art-based lithograph by Shepard Fairey, and launches alongside a vinyl LP box set and book. George Harrison fans are in for a treat next month. To celebrate what would have been the late Beatles' 74th birthday, a whole load of commemorative gear is launching, including a vinyl box set of his albums and an extended version of his book. 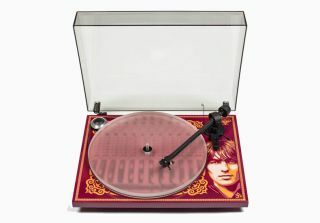 But taking pride of place is this limited edition George Harrison turntable from Pro-Ject. Called the George Harrison Essential III, it was designed by California-based design agency Studio Number One, and is based on a 2014 art-print litograph designed for the Harrisons by artist Shepard Fairey. It's limited to 2,500 units worldwide. Want one? It'll cost you £429. You can pre-order it here. And what better to play on your George Harrison turntable than all 12 of Harrison's studio albums, plus his Live in Japan album and a 12in picture disc singles of When We Was Fab and Got My Mind Set on You? For the first time, they're all collected in a George Harrison box set. Each record features an exact replica of the original release's tracklisting and artwork, and each is 180g heavyweight vinyl housed in a high-quality two-piece rigid slipcase box. The re-masters were taken from the original analogue tapes, and were cut at the legendary Capitol Studios in LA. It costs £455.99 and is available to pre-order now. Finally, Harrison's autobiography I Me Mine is also being reissued. Originally published in 1980, it recounts his upbringing in Liverpool, early Beatlemania and Harrison's spirituality and philosophy. This is an extended version, running to a mammoth 632 pages, and includes song lyrics and previously unpublished photographs. I Me Mine is also available to pre-order now, and costs £25.99. All three items will ship on 24th February, which would have been Harrison's 74th birthday.